Federal agencies responsible for natural areas are increasingly considering ecosystem services in their planning and management decisions. Operationalizing this new approach entails multiple challenges. To address them, the National Ecosystem Services Partnership launched the Federal Resource Management and Ecosystem Services project, whose participants created an online guidebook providing a framework and methodology to enhance consistency of ecosystem services approaches and describing how federal agencies are exploring or applying the ecosystem services concept. Two papers laid the groundwork for this guidebook: this one and BLM Land Use Planning: Consistency with the Federal Land Policy and Management Act and Other Applicable Law. 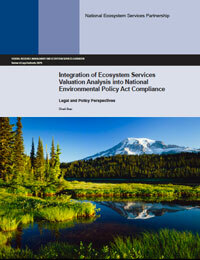 These papers explain how the National Environmental Policy Act and the Federal Land Management and Policy Act of 1976 enable or limit agencies’ incorporation of ecosystem services approaches into federal planning and management processes.